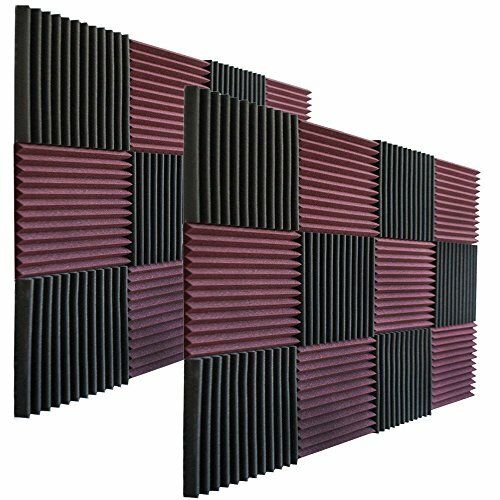 24 Pack - Burgundy/Charcoal Acoustic Panels Studio Foam Wedges 1" X 12" X 12"
1 inch wedge foam provides moderate sound control on walls or ceilings. This product provides strong noise reduction , where moderate deadening is desired. 1 inch wedge foam is most effective on mid-to-high frequency ranges. Our foam can be aligned perfec with the next piece to provide professional installation. Use: Perfect for use on walls, ceilings, doors, windows etc. Anywhere to help block sound and prevent echoes inside the room. If you have any questions about this product by Foamily, contact us by completing and submitting the form below. If you are looking for a specif part number, please include it with your message. Double Thick Studio Acoustic Wedge Foam Panels 12 Pk of 12”x12”x2” (Red/Charcoal) by NRG Acoustic to Remove Noise, Enhance Sound. Wall Foam Panels, Sound Proof Padding for Studios Vloggers, and More. 48 Pack BLACK Acoustic Foam Panel Wedge Studio Soundproofing Wall Tiles 12" X 12" X 1"